Dynamics Global Management was born at the end of 2010 thank to the effort and dedication of Francisco Galindo and Guillermo Pascual. We are a sportsmen and coaches global management, representation and advising company, which work all over the world with a special influence in Europe, and mainly in Spain. Our goal is getting the best of our clients basketball and human wise. For this, amongst others aspects, we own a modern and functional website, where everyone will find all the information and videos of our clients. We got several years of experience in the business working in other companies in the sports field, before Dynamics. 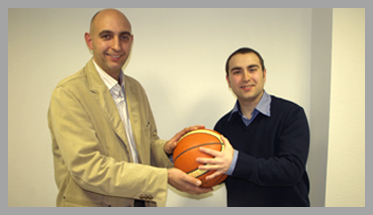 For that reason, now, through our hard work and international network, we are one of best basketball agencies at European level. We and our partners have all the licenses and legal permissions, national and international, as at sports level as at financial and company level, to be able to make its job. Dynamics’ members own Official FIBA Agent License, which it’s a powerful weapon to protect our clients. For all this, we, in Dynamics Global Management, will be proud and delighted to provide our services with total honesty and dedication to professional players and coaches and teams or organizations requiring our assistance or the performances of any of our clients.